You will discover that Byron Bay Beaches are some of the most beautiful in the world with white sand that stretches for miles. The sand is very fine and powder-like and among the best in the world. Best of all, if you head out of town, most of the beaches are deserted..
How would you like a beach all to yourself ? Given the number of Byron Bay beaches, that is very likely. The reason there are so many is mainly due to the Rocky outcrop of Cape Byron Headland. Australian beaches are mostly ocean beaches. One of the disadvantages with this is when there is an on-shore wind blowing it can make going to the beach very unpleasant indeed. So even though it may be a beautiful sunny day, if there is a strong on-shore wind it's normally best to give the beach a miss. We rarely have that problem with Byron Bay beaches. There is always somewhere sheltered to stretch out and catch some rays. as a bug on a rug. Belongil Beach is the closest dog friendly beach to the centre of town. Get to know all the Byron Bay beaches so you'll always know where to head. For a more detailed look at some of the more popular beaches, as well as pictures of the best Byron Bay Beaches - click on their names. 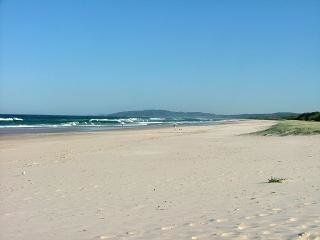 Lies directly in front of the town of Byron Bay, and continues southward (actually eastward) to Clarkes Beach. The Surf Club overlooks Main Beach and is patrolled by Surf Lifesavers in summer. From here you can snorkel out to the Tassie II, a wreck off the coast. Lies between Main Beach and The Pass, where the bay starts to curve around. Clarkes Beach faces north and so is idyllic most of the year, except for when the northerlies blow when it's best to head round to Cosy Corner. An extra surf-lifesaving team patrols Clarks beach in summer. It's normally a large flat area of sand, so is good for ball games and families. 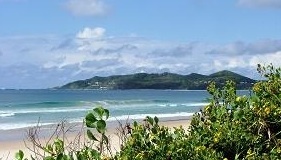 The Pass lies a the far end of Main and Clarkes Beach and is a gap between Fisherman's Lookout and the headland. It is one of the most popular surf breaks on the north coast.Dive boats and sometimes kayaks launch from here though, so care must be taken. Fisherman's Lookout is a wooden platform which you can climb for a view around to Wategos and watch the skill of the surfers below. Popular with parents taking children to frolic in the shallows and don't forget about the café up in the trees and there are a couple of barbecues up under the trees near the showers. The wreck of the SS Wollongbar has created a surf break just off Belongil Beach near the rock wall and Main Beach car park at the end of Jonson Street. You can normally see part of the wreck sticking up out of the water. Just over a small headland from Clarkes, and sometimes accessible by the beach depending on the tides, Watego's is a sheltered north-facing beach very popular all the year round. There are free electric barbecues and picnic tables overlooking the beach. Long rolling northerly swells make Watego's Beach ideal for malibus and longboards. On Sunday mornings you’ll often see the Byron Longboarding Club in the picnic area. Whales and dolphins often pass close off shore.Access is via Lighthouse Road and turn left into Brooke Drive. At the end of the Cape, Little Watego's is a tiny stretch of beach that sometimes almost disappears. It is a great rock fishing spot. Inaccessible by car (you have to walk over the path from Watego's or down from the lighthouse. Little Watego's is overlooked by the lighthouse and if you’re lucky you’ll be there when the conditions are perfect for a secluded swim and sunbake at Australia’s most easterly beach. Tucked under the south side of Cape Byron, Cosy Corner is a great sheltered spot when the northerlies are blowing. Now protected by the Arakwal National Park, the beach is accessible further down Tallow Beach Road, where you pay a National Parks fee of $6 to park your car. 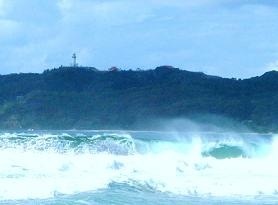 Beware of the surf here, as you get strong rips. From here you can see the hang-gliders circling the lighthouse and you may even have some coming in to land quietly beside you on the sand. Runs south from Cosy Corner all the way down to Broken Head. It’s great for long, uninterrupted walks, beach fishing. spotting birds, beach and surfing – though swimmers should take care as it can be dangerous. Watching the full moon rise from anywhere on Tallow Beach is pretty special.The surf here is choppy and erratic, so beware. Tallow Beach is accessible by walking south from Cosy Corner, or from several small car parks off Alcorn Street in Suffolk Park, and is dog-friendly for several kilometres. Access through Suffolk Park, via Clifford Street, off Broken Head Road just south of Byron Bay. At the southernmost end of Tallow Beach, Broken Head is another good surf spot. There are walking tracks up around the rocky headland where you can sit and watch the birds roosting or look out for whales. Is just south of the Headland and is a beautiful beach surrounded by shady Pandanus and National Park, it's a popular gay hangout and often clothing optional beach. Brays Beach and Whites Beach are beautiful little beaches, set amongst the rocky headlands south of Broken Head and Kings Beach. If you want even more secluded 'clothing optional' swimming and sunbathing, head this way and be prepared for some bush scrambling to get there. Bring some food and water and if you get there early, you might even get yourself a cave for the day. 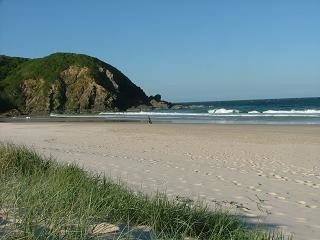 As well as the Byron Bay Beaches, we've included some north of the town. Access is via Grays Lane, just north of Byron Bay, turn off the Pacific Highway for airfield and drive through the National Park, Tyagarah is a remote beach, parts of which are designated 'clothes optional'. It's mostly a gravel road in to the beach, and if you see a number of cars parked in an area along the road, you've most likely stumbled upon the Tyagarah Tea Tree Lakes, where you can swim in the very clean, tea stained black freshwater, very refreshing after being in the ocean. It's clothes optional here too. 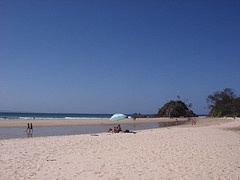 Cabarita is north of Byron Bay, and is situated on the coast road. It is a small township with a long ocean beach. Norries Headland makes for a long right hand point break. Great fishing from the beach, or in the estuary formed by Lake Cudgen. This area is very popular for parents with young children as the water is around 1m deep and excellent for boating, canoeing and fishing. Located in the north of the shire. These beaches can be reached by road off the Pacific Highway. Turn off the highway for north Ocean Shores and Ocean Shores. 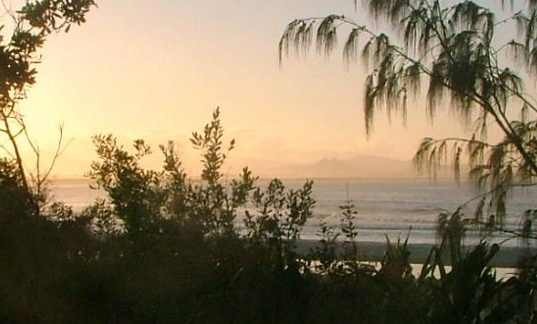 20km north of Byron Bay, on the mouth of the Brunswick River, Brunswick has both ocean beaches and river activities. There is a small sheltered beach near the groyne which is great for small children. When the tide's out the river becomes a popular sandy playground. The ocean beach south of the groyne is a dog-friendly beach and is patrolled by Surf Lifesavers in summer. Fishing off the groyne is popular too. This page has included all the Byron Bay Beaches, but as well as all these stunning Byron Bay Beaches, there are many more both north and south of Byron Bay, such as the beaches of Lennox Head and all the beaches further south down to Ballina, where you get stunning ocean and river beaches. 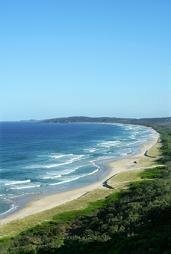 Have a look under the pages written for these towns for more info on the extent of Byron Bay Beaches.